The other day at CrossFit, our WOD (workout of the day) consisted of a set of strict presses (pressing the bar from shoulders to overhead) and a set of push presses (same movement, except with the addition of using your legs to help you press up). During the strict presses, I was a bit ambitious with the weight and ended up failing three of my five sets (we were supposed to build to a max 5 rep set at the end of five sets). No matter, I was more of a push press kinda gal. Again I was a bit over ambitious with the weight, but this time at least I made it to the 5th set without failing (although, just barely). Now I had 70 pounds resting on the rack in front of me waiting to be push pressed a full five reps.
Unbenownst to me, our trainer for this class was watching me. I did one, then two, then squeaked in three….it was getting heavy. Number 4…I dipped a little and pushed up with everything I had, and got so close, but my arms just couldn’t push anymore. As I (carefully) dropped the bar, I heard that collective exhale of disappointment from me, my WOD buddy and from my trainer ring over the thud of the weights hitting the ground. Disappointment is very loud. Then he imparted some words of wisdom. Nothing to do with technique or form (which was apparently great…surprising given how tight my shoulders generally are). It had to do with my attitude, my frame of mind. He says I tend to approach the bar very casually and had a pretty laid back attitude going into my sets. What I have to start doing is go to the bar determined, focused, ready to conquer and just pick that bar up and do it! Then I will complete 5 reps at 70 pounds because I have the strength, I am totally capable, I just don’t have the belief that I can. Yup. That sounds like me alright. Over ambitious, yet with a timid, almost fearful approach. Even Crossfit is trying to tell me the same thing everyone else has been saying all along: I am capable, but I have to believe I am. If I can just believe in myself, imagine the great things I can accomplish! Fill your favorite mug with Unsweetened Almond Milk (none of that vanilla flavored stuff) or your preferred milk of choice, and pour it into a small saucepan. Place the saucepan over a medium low heat. Break apart two squares (2 oz) of semi sweet chocolate (a fancier quality. I had Ghirardelli on hand) and plop into the milk. Slowly whisk the melting chocolate and milk until the chocolate is fully melted, and there is just a wisp of steam coming off of the milk (but not boiling). Here you can add some ground cinnamon and or ground ginger (it sounds weird, but it gives it a nice spiciness…amounts depends on your taste. I kinda just eyeball it.). Pour back into your favorite mug. 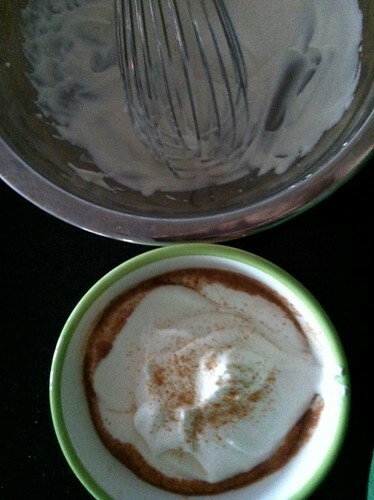 Pour a bit of heavy cream into a medium sized bowl (a half cup will yield enough whipped cream for 2-3 cups), and with the whisk (I ended up cleaning the one I used for the hot chocolate….but you can just reuse it), and whisk away. When it looks a bit thicker in consistency, add in about a teaspoon of sugar (more if you want it sweeter) and a dash of vanilla extract. Continue whisking until you get medium peaks. I took me three minutes from start to finish. Top hot chocolate with a generous dollop of whipped cream and enjoy! Don’t use chocolate chips for this. I tried a few times, and I found that it leaves a rather gross top layer of waxy stuff as the hot chocolate cools. Use bar chocolate. Feel free to use a darker chocolate if you like. Definitely whisk the chocolate and milk together. I’ve done it just stirring since I’m not so keen on running a whisk against the non-stick coating of my saucepan (I do it very gently, and try really hard not to scrap the bottom). If you stir, the chocolate never really fully incorporates in with the milk, and you won’t get that smoother hot chocolate texture. Instead of vanilla extract, try just a touch of peppermint extract. Make your own whipped cream. It literally took me three minutes from start to finish, including time to fetch and add the sugar and extract. So worth it and so much better for you than anything that came from a can. Now, another option instead of whipped cream is to make a whipped coconut cream. I can only imagine greatness with that combination. If someone tries it, let me know how it turns out! 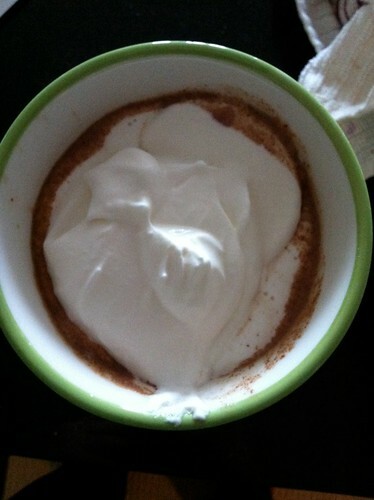 This entry was posted in Dessert, Drinks and tagged Crossfit, Hot Chocolate, Whipped Cream. Bookmark the permalink.